Accepted at over 100,000 locations! Sell Restaurant.com Gift Cards Worth $50 for only $20! FREE Custom T-shirt Prize Plan with every fundraiser! Your sellers get a FREE Custom T-shirt with your group's logo and slogan for every 10 Restaurant Cards you buy. To be eligible for the FREE T-shirts you must call us at 1-888-440-4114 to place your order. The Restaurant.com card gives your supporters a $50 value for only $20! Your supporters are given access to over 18,000 restaurants nationwide. To use it, your supporters will go to Restaurant.com, enter their special code, and browse the participating restaurants. Once they’ve found a restaurant they like, they simply print: one $50 certificate, two $25 certificates, or five $10 certificates, take it to the restaurant, and present it the same as cash. To use it, your supporters will go to Restaurant.com, enter their special code, and browse the participating restaurants. With over 18,000 merchants participating it will be easy to find one they like. Once they’ve found a restaurant they like, they simply print: one $50 certificate, two $25 certificates, or five $10 certificates, take it to the restaurant, and present it the same as cash. Priced to Sell: Your supporters received $50 in restaurant gift certificates for only $20! Your Profit: It varies between 50% - 65% profit depending on the quantity of Restaurant.com cards ordered. The more you sell, the more you make! Free Shipping and Low Minimums: Your group receives free shipping on all orders, and the minimum order is only 75 cards. Payment Methods: credit card, money order, purchase order form for public schools, 30-day financing available – call us! How Does The Restaurant.com Discount Card Work? 1. Determine how many fundraising participants will take part in your fundraiser. 2. Order between 5-10 Restaurant.com discount cards per participant, depending on how motivated you feel they are. 3. Place your order online or over the phone. You may pay using a credit card, money-order, or if you’re a public school you can issue a purchase order form. 4. Shipping is quick: We always ship out your product the next day following receipt of your payment. Depending on your location, shipping time is approximately 7 business days. 5. Prepare and send a letter to your group members and their parents so they are aware of the objective of your fundraiser, collection dates, and your contact info. 6. 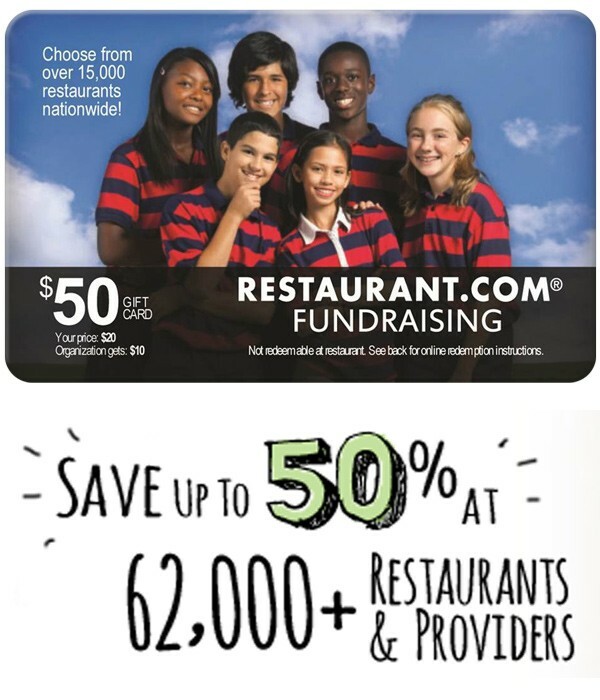 Keep track of how many Restaurant.com discount cards you have distributed to each of your fundraising participants. Ideally, have the parents pick them up so they become more involved in the fundraiser. 7. Your participants will sell each of these Restaurant.com cards for $20 each (pre-determined by you at time of purchase), and collect their money on the spot. 8. Keep a tally of all the money you collect from each of your participants throughout your fundraiser. 9. When the fundraiser is complete, be sure to send a Thank You note to all parents and kids who participated. 10. Count the profit made from your fundraiser!